One of the earliest maps to name Seattle. Map of a Part of the Territory of Washington to Accompany Report of Surveyor General 1855. One of the earliest surveys of Washington Territory and one of the earliest maps to identify Seattle. This is an attractive first edition example of the 1855 public survey map of a part of the Washington Territory prepared by James Tilton, Surveyor General of Washington Territory. 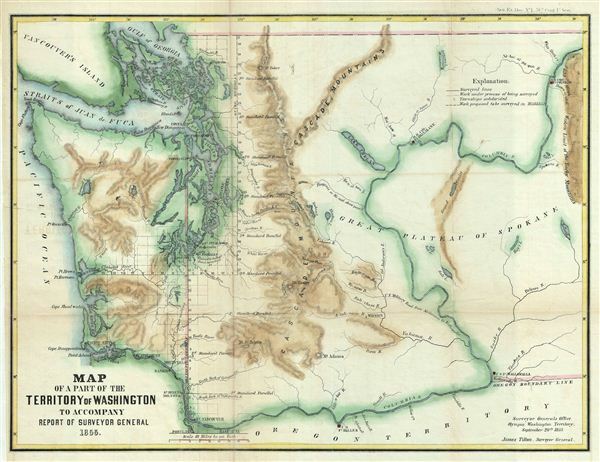 The first Surveyor General's map of the Washington Territory, this map covers the region from the Pacific Ocean to the western foothills of the Rocky Mountains. Most of the significant survey work is limited to the lands to the east of the Cascade Mountains, with the state of the land survey noted via a series of blocks representing the survey grid. An explanation in the upper right quadrant explains the various lines on the blocks. Seattle is identified as 'Statle,' just two years after its founding, making this one of the earliest maps to identify the fledgling settlement. Seattle was intended to be the endpoint on Governor Steven's impractical northern route for the Pacific Railroad. One year after this map was made, the Battle of Seattle, part of the Puget Sound War over land rights in the region, was fought. The map marks the 'Steven's Route Pacific R.R.' and 'U.S. Military Road from Steilacoom to Wallawalla.' Several forts are noted, including Fort Okinakane, Fort Dalles, Fort Wallawalla, Fort Steilacoom, and Fort Colville among others. Various cities, rivers, lakes, mountains, islands and various other topographical details are also noted. Wheat notes that the map is important in showing the Hudson's Bay Company's posts at Fort Okinakane and Fort Colville, along with the location of Lake Chelan, east of the Cascades. Prepared for issue in the 1856 congressional report, Maps and Views to Accompany Message and Documents 1855-56. eleven subsequent editions, some with different titles, were published in the years 1855, 1857, 1857, 1858, 1859, 1860, 1861, 1862, 1863, 1865, and 1876. The General Land Office (1812 - 1946) was an independent agency charged with the administration and sale of public lands of the western territories of the United States under the Preemption Act of 1841 and the Homestead Act of 1862. During a time of frenetic energy and rapid westward expansion, the Land Office oversaw the surveying, platting, mapping and eventually the sale of much of the Western United States and Florida. The structural layout of the western United States that we see today, and many of their district and county divisions, are direct result of the early surveying work of the General Land Office. More importantly, as a branch of the Federal Government in Washington D.C. and the only agency able to legally sell and administer public lands in the western territories of the United States, the General Land Office played a pivotal role in consolidating power away from the original states and into the hands of the centralized federal government. The General Land Office was absorbed into the Department of Interior in 1849 and in 1946 merged with the United States Grazing Service to become the Bureau of Land Management. Today the Bureau of Land Management administers the roughly 246 million acres of public land remaining under federal ownership. August Hoen and Company (fl. c. 1840 - 1981) was a Baltimore based engraving and lithography firm active in the middle part of the 19th century. A. Hoen & Co. was originally founded by Edward Weber under the name 'E. Weber & Company. Weber died in the early 1850s and his company was taken over by German immigrant August Hoen (18?? - 1886) and his brothers, Henry and Ernest Hoen. As general interest lithographers, the Hoen firm's corpus includes posters, cigar boxes, sheet music covers, and posters as well as maps. They are best known for their pioneering multi-color lithographic techniques. After the death of August Hoen, the business passed on to his son, Albert Hoen. Another son, Earnest A. Hoen, moved to Richmond, Virginia and opened a branch of the firm there where he was granted a charter to produce Civil War era Confederate Currency. Their contributions to the cartographic field are generally in association with engraving and printing work done for Jacob Monk and the U.S. Geological Survey. The Hoen family maintained an active interest in the firm for the next 100 years or so until it finally filed for bankruptcy in 1981. Maps and Views to Accompany Message and Documents 1855-56, (Washington: Nicholson) 1856. Very good. Original fold lines visible. Minor wear on original folds. Professionally flattened and backed archival tissue. Rumsey 1079.001 (without color). Wheat, Carl Irving, Mapping of the Transmississippi West, 1540-1861, 896.